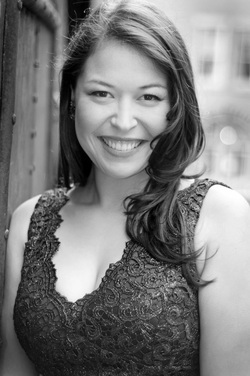 Mezzo-soprano Monica Soto-Gil is a charismatic and versatile performer whose repertoire includes opera, art song, sacred, and contemporary music. This season, Monica performed in concert at the National Gallery of Art as a soloist with the Inscape Chamber Orchestra. This summer, she spent a second summer as an Apprentice Artist with Central City Opera, where she covered the role of Mrs. Gibbs in Our Town, and performed as a member of the ensembles in Showboat and Our Town. Past highlights include Mrs. Gobineau in The Medium, Kate in Oklahoma! and Mrs. Grose (cover) in A Turn of the Screw in Central City Opera’s 2012 Festival season, 2nd Woman and Dido (cover) in Dido and Aeneas with Poor Richard’s Opera, as a guest soloist with the Young Artists of America, as Mrs. Balandard in M. Choufleuri restara chez lui with Bel Cantanti Opera, the Alto soloist in the Mozart Requiem with Capital City Symphony, Rosina in Il Barbiere di Siviglia, Paula inFlorencia en el Amazonas, and Marva (cover) in Shadowboxer with the Maryland Opera Studio and as an ensemble member in The Metropolitan Opera’s 2013 production of Parsifal. Ms. Soto‐Gil received her Bachelor of Music from the New England Conservatory of Music in Vocal Performance under the tutelage of the late Edward Zambara. She earned her Master of Music as a member of the Maryland Opera Studio where she studied with Delores Ziegler.